I have devoted more than half my life to music, and in particular Hip Hop Culture. Ever since I was young, music has been the driving passion of my life. I probably broke about 5 of my parents turntables trying to learn to scratch. I broke at least 5 bones breaking and b-boying, and have broke 1000's of pencils writing rhymes. I grew up in the Va Zone moving around Northern Va, mostly. I knew I was becoming more interested in Clubs/Music when I quit basketball because it interfered with going to Clubs in D.C. I landed my first real gig as a b-boy dancer in 1993. I moved up to NYC to start choreographing, and dancing for the group "DEEE-Lite". 1996 found me back in D.C. where I wanted to pursue my talents and business options in "Home Base." 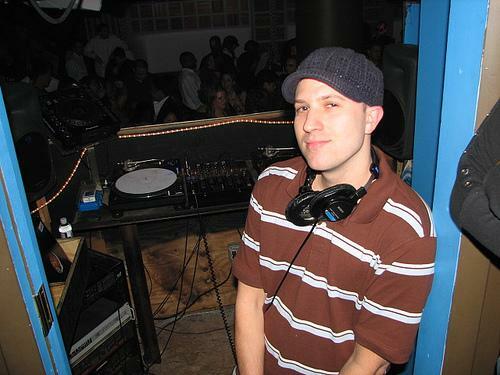 I starting djing around D.C. a lot, and also promoted parties with several of my boys. The two most recognized were "Pollen" and "Soul Camp". In 1997 I started working at the world renown "12 inch Dance Records". Working there led me to start promoting the Annual DMC DC Regional Turntable Battle which I still do today. In 2002, along with Niv Farahandouz, and James Graham, I opened DJ Hut. In the same space as 12 inch, we continued the legacy of Vinyl and Dj Preservation. Giving the store a complete facelift, we put a fresh face on a longtime music institution. We are still going strong today, check out our shop at: www.djhut.com. MCing and writing rhymes was a great passion of mine as well. I wrote my first rhymes back in 1985 influenced mostly by Run Dmc. I ran around the freestyle/battle circuit for a long time. That is where I met my Rhyme Partner Jamal aka "JihadIsreal". In 1998 we formed the Super B-boy group "Defined Print". Our first EP "The Fine Print" was released in 1999. Defined Print followed up with the "Rhymes Connect EP" in 2001. Produced by Depth Charge Recordings and Team Demolition, "Rhymes Connect" gathered strong indie and overseas play, leading to the song "My Library" produced by Zechariah Wise to be used in compilations, and on the X Games. Jihad and I still try to work on music when we find ways to stop time from our busy schedules. My Dj life is pretty much where I spend most of my creative time now. It has come completely full circle for me. Along with guest spots all over the DC area, I play every Thursday at Mie N Yu Restaurant, and every Friday at Modern. You can also catch me once in a while on Saturday night at Fly Lounge. Check out for some new mix cd's along with remix and production work in the near future. Peace..